Colin Barron's niece, Daisy Ogg, beside the memorial. Colin Barron was just one of millions of young men who signed up to serve during the war, but his exploits have become the stuff of legend. And yesterday, family friends and surviving relatives joined together at Boyndie to unveil a memorial for him – 100 years after he received the Victoria Cross. Born in 1893 and raised at Baldavie Farm in Boyndie, Mr Barron was brought up by his grandparents, Joseph and Mary, before the outbreak of war. He enlisted in 1914 and, three years later, while he was serving as a corporal with the 3rd Infantry Battalion near Passchendale, the 24-year-old was credited with saving the lives of the men in his unit. For his bravery, he was awarded the VC. The citation affirmed the award was: “For conspicuous bravery when in attack, his unit was held up by three machine guns. “Cpl Barron opened up on them from a flank at point-blank range, rushed the enemy guns single-handed, killed four of the crew, and captured the remainder. 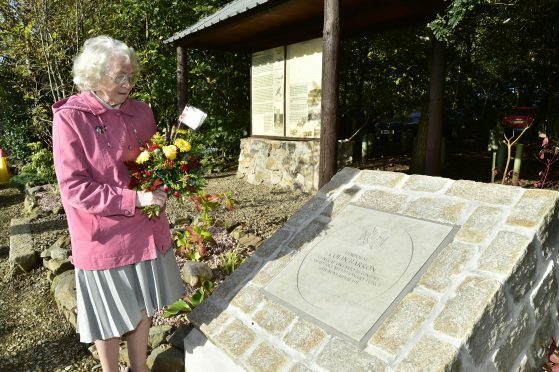 The service to commemorate his achievements took place yesterday at Boyndie’s visitor centre, where relatives including his 83-year-old niece, Daisy Ogg, laid flowers in tribute. Mr Barron had emigrated to Canada as a teenager and later achieved the rank of sergeant-major in its armed forced. He served his country again in World War II and is buried in Toronto’s veteran’s cemetery. He is one of just nine north-east men to have been awarded a VC during the war. Others include George McIntosh of Buckie, who was honoured in 1917 after seizing an enemy dugout during the Battle of Passchendaele, and Joseph Watt of Gardenstown. Mr Watt was awarded the decoration for his part in a naval battle at the Strait of Otranto, where his eight-man crew was outgunned by the 424ft-long cruiser Novara.